It’s been quiet on The Light Ships blog because there’s so much to do getting the book ready and preparing for the events which will be happening in November – more news about all that next week. But in the meantime, here are some photos of the Italian Chapel, on the island of Lamb Holm. I had a longstanding invitation to give a lecture in Kirkwall at the end of September so I got to spend a weekend in Orkney, which is one of the loveliest and most interesting places I know. When a friend took me to see the Chapel I saw why it is the most visited site in an area not short of wonderful monuments right back to Neolithic times. The chapel was created by Italian prisoners of war, who were in Orkney to work on the Churchill Barriers which link several islands and close the eastern approach to Scapa Flow. The men requested a chapel and were assigned a couple of Nissen huts. In a few months of 1943, using only salvaged materials and working in their spare time, they created an extraordinary vision of the kind of church they were used to attending at home. Several men were skilled craftsman, including the painter Domenico Chiocchetti, who was responsible for the Madonna and Child among much else. When they left, in September 1944, they entrusted the chapel to the people of Orkney who have looked after it impeccably in subsequent years. Signor Chiocchetti and others of the men involved returned in later years to do repairs and add further embellishments, cementing a friendship that had grown in the least auspicious of circumstances, and across all the cultural distance between Orkney and Italy. Today, the Italian Chapel continues to bear witness to humanity’s creativity in its search for meaning: a northern light ship. You expect to see stained glass in an English parish church: it’s one of the visual signs that instantly identifies a church as such, like a spire. Most of it was put in by the Victorians, because so much was destroyed by puritans and other iconoclasts in the 16th and 17th centuries. The Victorians meant well, and some of their work is very fine, but often it’s literal, sentimental and crudely coloured, like the pictures in the King James Bible I was given at primary school. And so, as a result, we see the splash of colour in a church, but don’t often look at the pictures it makes. These three windows, which fill the Victorian apse added to the east end of Sutton St James church, are what you see when you come into the church. When I was there, the southern one glowed with sunshine (which is why the photograph is so dark and bright), but I didn’t look very closely. So these images were created in the years after the Second World War, by a local farming family to honour and remember those they had loved. No more and no less than the continuing process of the generations leaving their mark on their church, for themselves and those who come after. Without church towers to recognise you by? 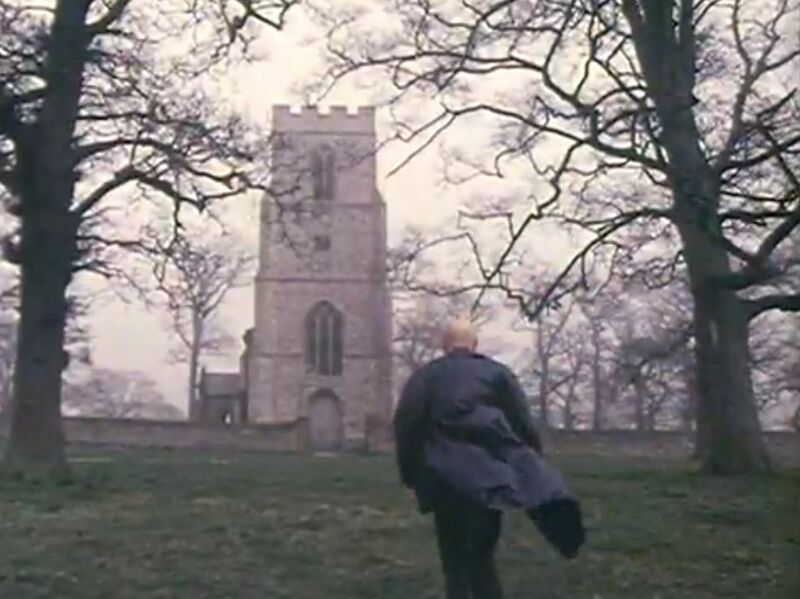 It’s impossible not to look at and write about English village churches without the presence of John Betjeman. 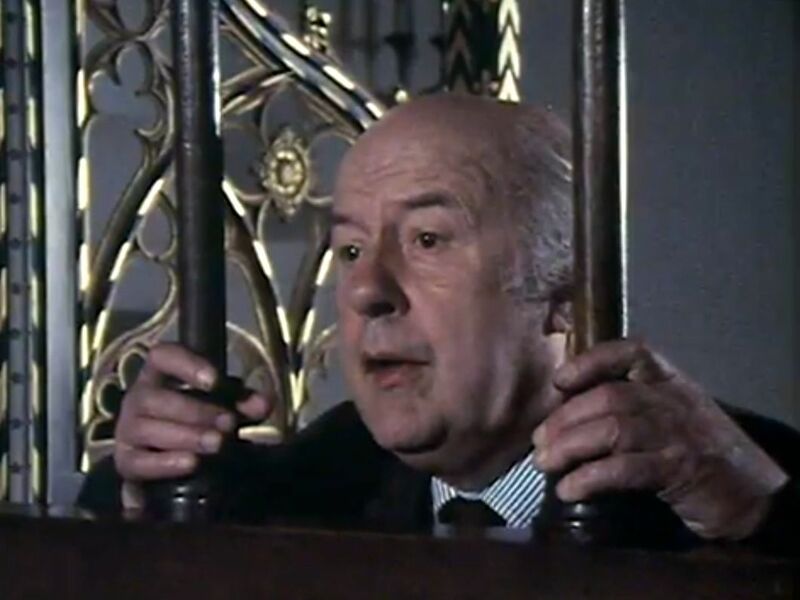 Although he will be remembered as a highly original poet, and was widely appreciated as such in his lifetime, it was his television films that made Betjeman such a recognisable figure in the 1960s and 1970s. Made in television’s salad days, before its executives thought they knew what was good, these are highly personal portraits of places and things that Betjeman loved: the seaside, trains, architecture and, repeatedly, churches. 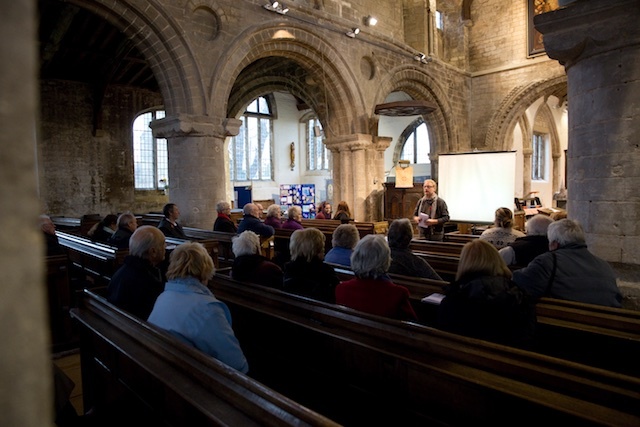 One of the best, A Passion for Churches, is about Norfolk’s churches and it can be watched on the BBC iPlayer. In it Betjeman visits some wonderful places: Trunch, Sandringham (where Tony Fitt-Savage was organist at the time), Cley-next-the Sea. Ah that’s music in your ear, that’s music in the ear. Once that gets hold of you, I suppose that’s like smoking cigarettes; once that gets hold of you that, that’s a drug: you can’t get rid of it. There’s something about it, I don’t know what it is, but you’d go anywhere for it. If there weren’t somewhere where there were some bells I’d go crazy, I know I should. Bells are life to me. I mean, it never seems Sunday to me if we don’t hear the bells. But it’s hearing the Norfolk in Mr West’s voice that gives that statement its poetry. 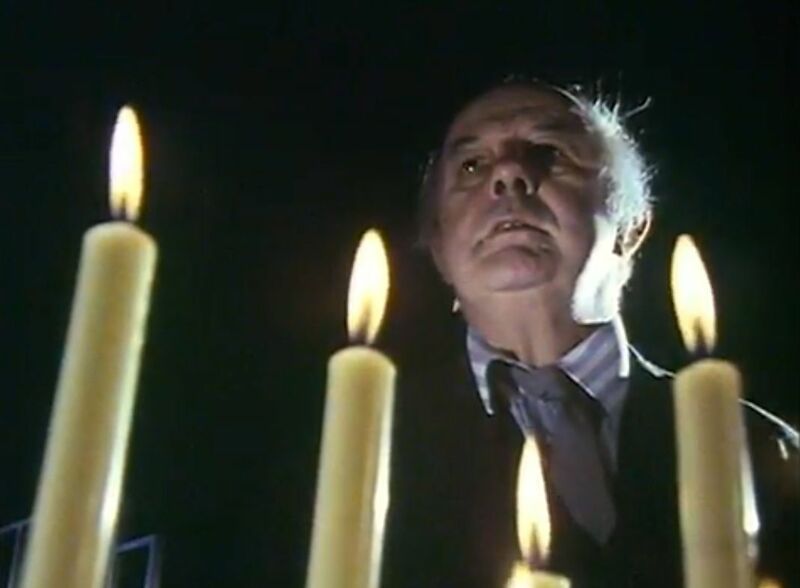 And poetry runs throughout the film as Betjeman shifts easily from prose to verse in a way no one would dare to do today. And should we let the poor old churches die? Do the stones speak? My word, of course they do. How fearful and how final seems the grave. Help us, we’re all alone and full of fear. Most tolerant and all embracing church. A Passion for Churches was made forty years ago. It’s not just the clothes and plummy voices that seem to belong to another age. Such public statements of belief would cause embarrassment in public life today. It’s Philip Larkin’s post-religious ‘Church Going’ rather than Betjeman’s faith that fits the tenor of the age. Nothing is more remote than the recent past: not yet history but how we were is already unthinkably strange. Thus we live and pass and all that we believe to be normal is just more of the vast oddity of human beings. 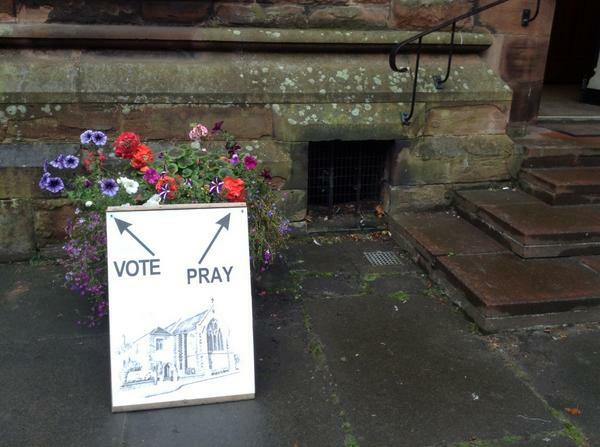 In some churches all prayer has ceased. St. Benedict’s, Norwich, is a tower alone. A lighthouse beckoning to a changing world. Fred Thorpe was born in Moulton Chapel in 1894 and attended the primary school there. He painted this picture at school, when he was about ten years old – so it dates from about 1904. It’s a bit the worse for wear, but its colours have remained beautifully vivid, and like many children’s drawings it’s full of attention to the detail of life. Children are often excellent at looking, though their technical control of paint and pencil may not yet be as strong. 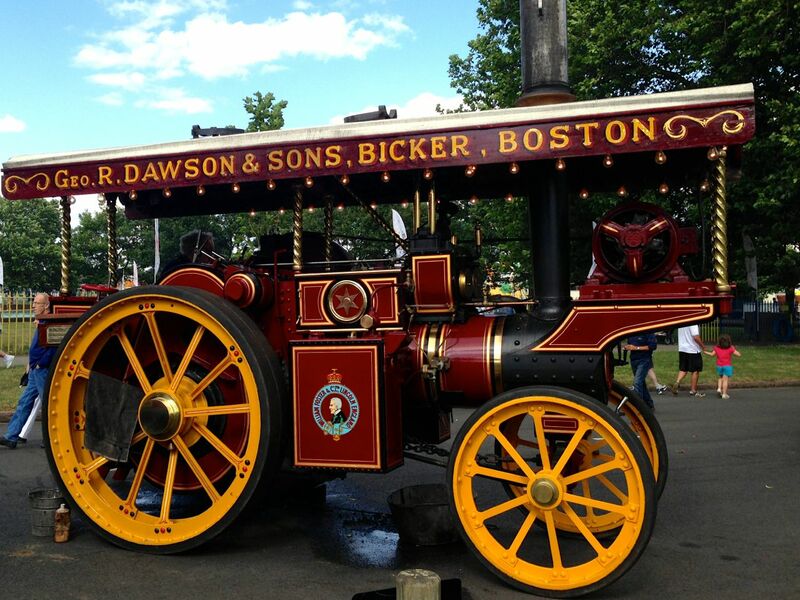 After school, Fred went into farming, working as a cultivating and threshing contractor, initially with steam engines – probably like this one, lovingly maintained by the Dawson family of Bicker, and which you can see at the Steam Threshing event in aid of church funds, this coming weekend. Both his son and his grandson followed hi into the contracting business, working across lower South Holland. Church flower festivals, which are such a beautiful aspect of life in the Lincolnshire fenlands mostly take place in the spring. But one or two cannily wait until later in the year and Whaplode is one of those. If you have some time this weekend, do try to get there. 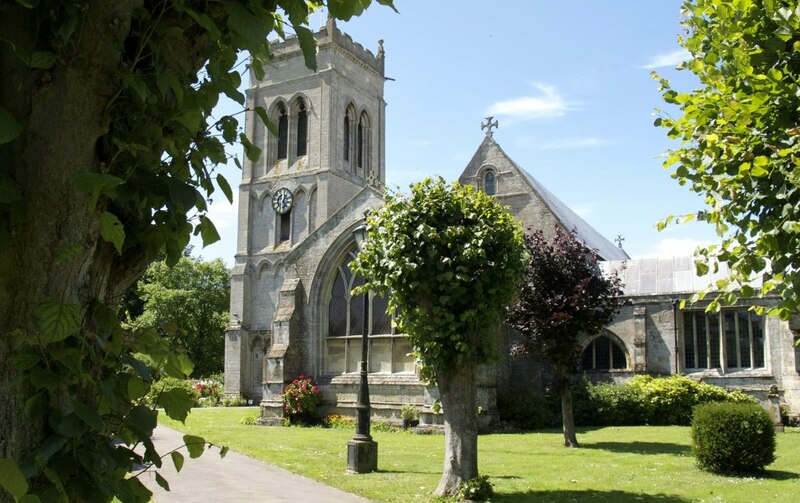 As well as the flowers, there’s an organ recital, bell ringing, live music, teas, a hog roast and much more – all at one of the most beautiful, interesting churches in the Fens. It’s the kind of celebration that has been going in churches and churchyards for hundreds of years: a community coming together to celebrate being who they are. 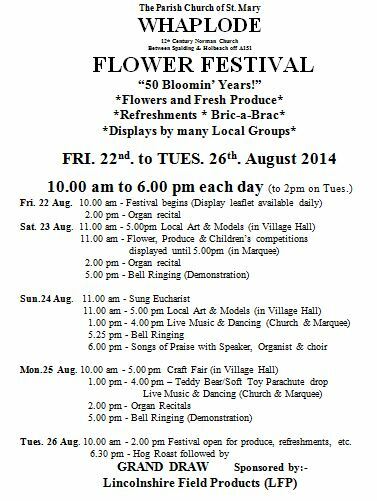 2014 is the 50th anniversary of the Whaplode Flower Festival – Long may it continue.